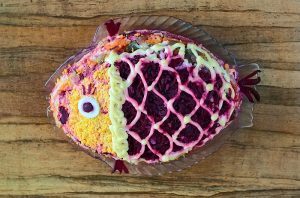 One cannot imagine a New Year’s feast without the jolly Herring Under Fur Coat, a layered salad where boiled beets, carrots, potatoes and onions constitute the fur coat. 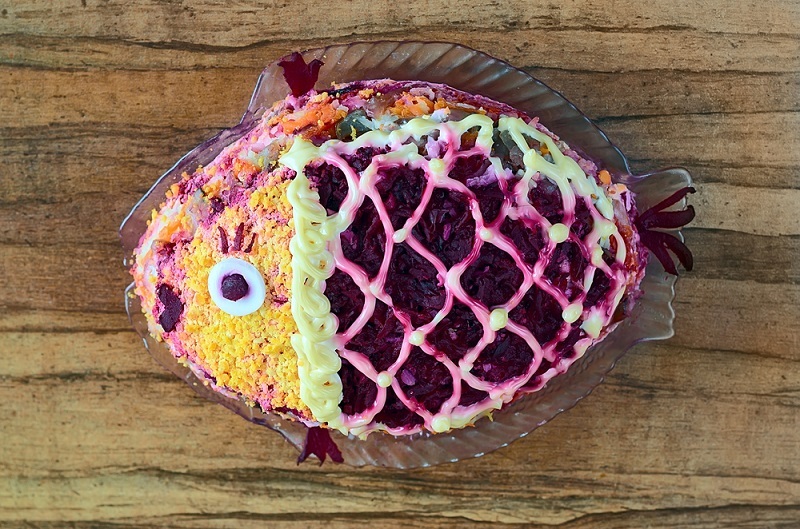 A legend credits it to an eatery owner who came up with this nourishing dish that went well with vodka and kept his customers from fighting and smashing dishes. Supposedly, herring symbolized the proletariat; potatoes and onions, the peasantry; and the beets, the red flag of the revolution. Or it might have come from Norway because it’s said that “a true Norwegian eats herring twenty-one times a week.” Whatever the origin, the metaphor in the name was as Russian as borscht – in the winter everyone wore fur on their heads and women’s coats sported a fur collar, or a detachable fox complete with a bushy tail and a snout. In reality, the Fur Coat, as the dish is affectionately called, was born in the late 1960s Soviet Union, an era of universal shortages. It caught on because the ingredients were relatively easy to obtain in the winter. Like with borscht, each hostess has her own version. The memory of New Year’s Eve celebration causes former Soviets wax nostalgic about their motherland. And for good reason: that holiday was dedicated to a day in the calendar, not revolution or world proletariat. Even the Party could not appropriate the calendar. Every December 31, the tables presented a vision not often seen during the year. The assortment was mostly the same in most homes. And so were the boastful tales by the triumphant, dog-tired hostesses about the endless lines and the scheming involved in getting the feast together. 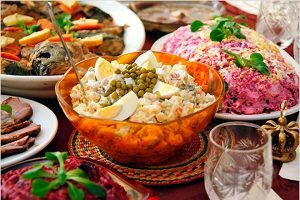 On December 31, 1976, our table showed off the familiar menu: chopped liver, jellied meat, gefilte fish, beef tongue, olivie salad (potato salad), herring. This time the table was located in Chicago so it also carried stuffed peppers and fresh fruits and vegetables – in the winter! The talk was about the store shelves crammed with foods and about polite sales people and the endless lines and scheming of our former lives. We, the last of the Mohicans of that era, still share these memories, on New Year eve and any other occasion, with anyone who would listen or pretend to listen. And we remain true to the humble delicacies. The excitement of preparing them has long gone though – Russian delis and restaurants do the cooking now. 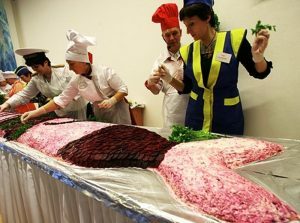 In 2010, the Russian city of Kaliningrad marked the annual Herring Day by producing 1,300 pounds of the Fur Coat, 40 feet in perimeter. The cooks used 110 pounds of herring, 250 pounds of each beets and carrots, 420 pounds of potatoes. Russia intends, they say, to turn this region into “the Russian Hong Kong”.